The ideals at the heart of Buddhism are collectively known as the Three Jewels, or the Triple Gem. These are the Buddha, the Dhamma, and the Sangha. It is by making these the central principles of one’s life that one becomes a Buddhist. The Buddha refers both to the historical Buddha. The Buddha is honored as a special human being who, confronted with the palpable suffering in the world and convinced that there had to be something more, sought and won enlightenment. Buddha means “awakened one”, as his enlightenment was a “waking up” to the world as it really is, free from delusion and ignorance. Consequently, in Buddhism, the Buddha is the prime source of inspiration and authority for adherents. Dhamma has many meanings but most importantly it means Truth (as experienced by the Enlightened mind) and the Buddha’s Teachings. Dhamma is the teaching that was born when the Buddha first put his realisation into words and communicated it to others at the Deer Park in Sarnath in Northern India. 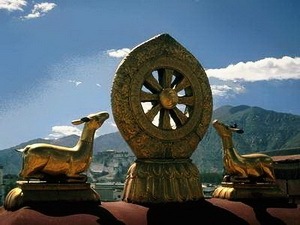 The occasion is traditionally referred to as “the first turning of the wheel of the Dhamma” and the eight-spoked Dhamma wheel is a common emblem of Buddhism. As well as this Dhamma, refers to the entire corpus of scriptures which are regarded as constituting the Buddhist canon. These are called the Tipitaka or the “Three Baskets”. The whole canon is many hundred times as long as the Bible and it represents a literature of unparalleled riches. Another meaning of Dhamma is the practices which are outlined within the scriptures. The third of the “Three Jewels” is the Sangha or the spiritual community. Buddhism is not an abstract philosophy or creed; it is a way of approaching life and therefore it only has any meaning when it is embodied in people. The word Sangha is often used to refer to the enlightened disciples of the Buddha. Sometimes it is also used to refer to the monastic community founded by the Buddha. Monks and nuns have special significance because they are seen as making the Buddha’s teachings the exclusive focus of their lives. They take a vow of celibacy and devote their lives to meditation and study. To the lay community they exemplify the Buddhist life par excellence providing example, guidance and inspiration. In the broadest sense the Sangha means all of the Buddhists in the world and all those of the past and of the future.